The review discusses recent advances in the field of acid-catalyzed intra- and intermolecular transformations of pinane terpenoids and their oxygen-containing derivatives. Original Russian Text © I.V. Il’ina, K.P. Volcho, N.F. Salakhutdinov, 2008, published in Zhurnal Organicheskoi Khimii, 2008, Vol. 44, No. 1, pp. 11–31. Irina Il’ina was born in 1975 in Mokhsogollokh village (Yakutia). In 1997 she graduated from the Novosibirsk State University (specialization organic chemistry) and in 2007 sustained her Candidate’s thesis. I. Il’ina now works as engineer at the Wood Chemistry and Natural Biologically Active Compounds Laboratory, Vorozhtsov Novosibirsk Institute of Organic Chemistry, Siberian Division, Russian Academy of Sciences. Field of scientific interest: chemistry of natural compounds. Konstantin Petrovich Volcho was born in 1969 in Novosibirsk. In 1993 he graduated from the Novosibirsk State University (specialization organic chemistry) and in 1998 sustained his Candidate’s thesis in chemistry. K.P. Volcho now works as senior researcher at the Wood Chemistry and Natural Biologically Active Compounds Laboratory, Vorozhtsov Novosibirsk Institute of Organic Chemistry, Siberian Division, Russian Academy of Sciences. Fields of scientific interest: chemistry of natural compounds, asymmetric synthesis. Nariman Faridovich Salakhutdinov was born in 1954 in Tashkent. In 1976 he graduated from the Samarkand State University (specialization organic chemistry). Since 1976, N.F. Salakhutdinov worked at the Novosibirsk Institute of Organic Chemistry. In 1982 he sustained his Candidate’s thesis in chemistry, and in 1998, Doctoral dissertation. N.F. 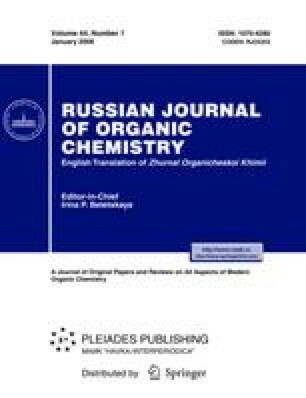 Salakhutdinov is now Head of the Chemistry of Natural and Biologically Active Compounds Department at the Vorozhtsov Novosibirsk Institute of Organic Chemistry, Siberian Division, Russian Academy of Sciences. Fields of scientific interest: chemistry of natural and biologically active compounds.